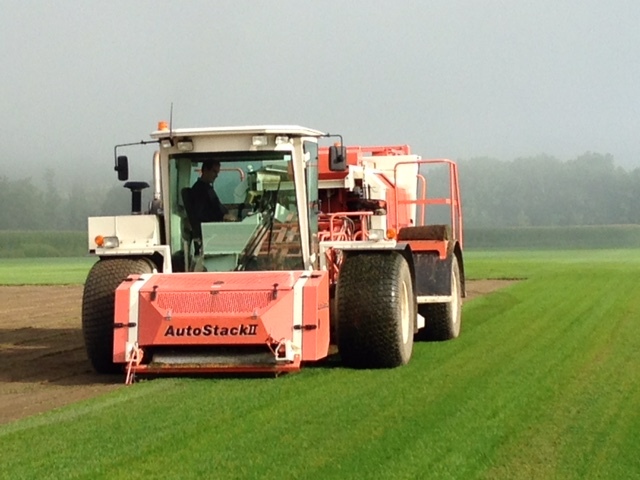 Around the Farm - Saratoga Sod Farm, Inc.
What goes on around the farm throughout the year? Here’s a glimpse of the processes that take place during each season to prepare the land, plant, grow, and harvest the crops. Our production and sales “season” runs from April through November. During the winter, our shop team is busy rebuilding and overhauling equipment, and our marketing team attends tradeshows and meetings focusing on the upcoming sales season. 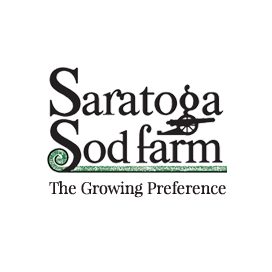 Saratoga Sod grows roughly 600 acres of sod, and 500 acres of row crops- corn, soybeans and barley annually. Why does a sod farm produce other crops? It allows for rotation of fields to replenish the soil (different crops use or contribute different amounts of nutrients), to break the pest and weed cycles, and diversity. While some of the processes are the same, preparation is much more intensive for sod than for other crops—averaging 8 “passes” over the field vs. 3. Saratoga Sod incorporates environmentally sound farming methods, integrated pest management, and uses turf tires to reduce soil compaction. Whether for sod or row crops, it’s important to test the soil prior to planting to determine nutrient requirements for amendments, like lime and fertilizer. Although soil types and conditions can vary, proper soil preparation is essential to eliminate layers or hard pans, provide better air and water movement, and enhance deep rooting. Cultivation turns and loosens the upper layer of the soil, bringing fresh nutrients to the surface, while burying weeds and the remains of previous crops, allowing them to break down. The plow creates long trenches of fertile soil called furrows. The plowed field is typically left to dry out, and then disked to break up large clumps of soil. 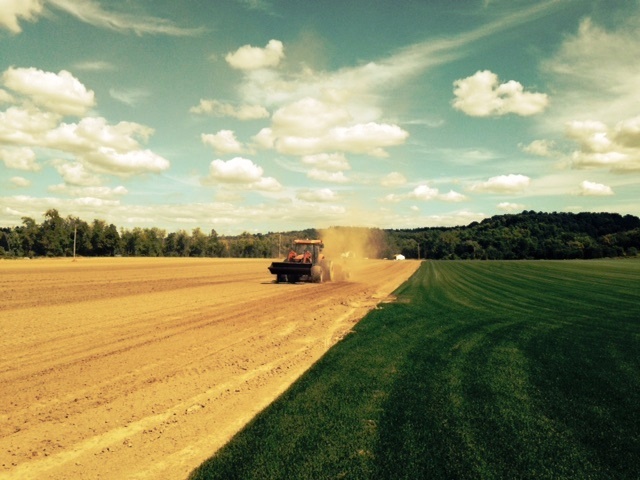 Cultipacking firms and smooths the seedbed before planting. For row crops, the soil is cultipacked again after planting to improve soil to seed contact. 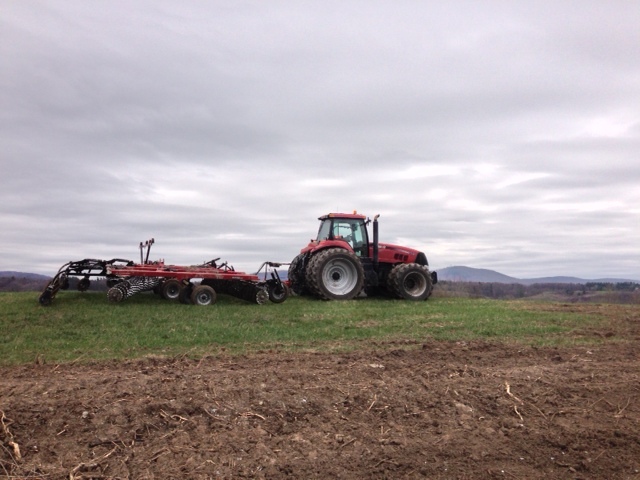 After cultipacking, a land plane is used for leveling fields prior to planting turfgrass. 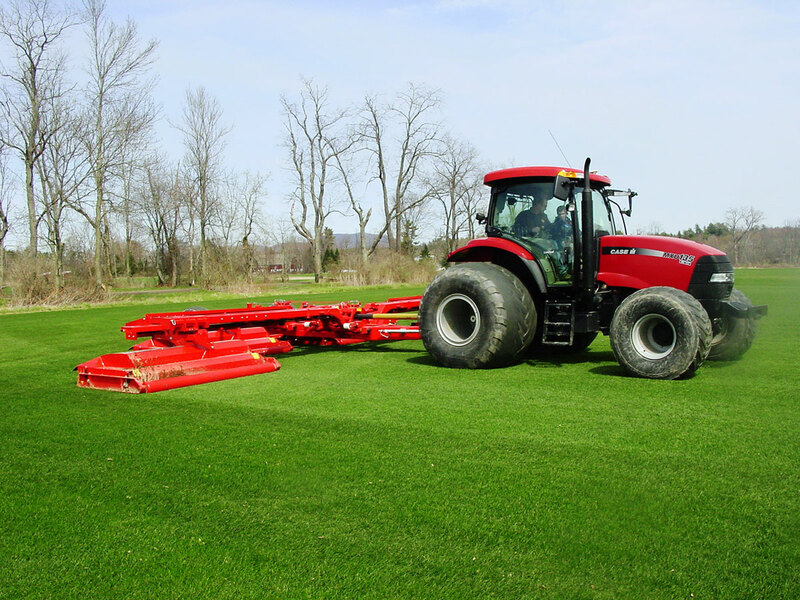 A field is usually planed in several directions to eliminate low spots. The surface must be smooth and uniform; if there are surface irregularities from poor soil preparation, the sod harvester blades will not cut the sod uniformly and yield will be reduced. The power harrow stirs the soil to incorporate fertilizer and maintain good soil structure. It is the final soil preparation tool used prior to planting. We seed new sod fields at one time each year- usually in August. These fields will grow and be maintained for 2 years before being harvested. A seeder is used to seed turfgrass. 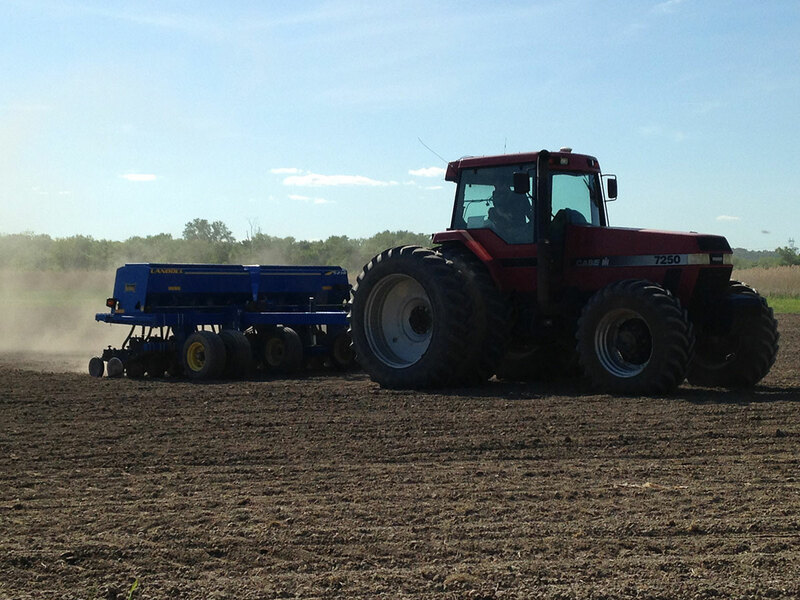 A planter is used to plant corn and soybeans, and a grain drill is used for small grains. Water is essential to grow healthy crops. We generally irrigate mature sod as needed to maintain a healthy stand of turf. Portable rain reels allow for irrigating multiple fields as needed, and center pivots are used to irrigate sod on sand ground. We generally do not irrigate our other crops. 600 acres of sod require lots of mowing! During the peak growing season, sod fields are mowed every other day to maintain the optimum height of 2 ½ inches. This is accomplished with a combination of rotary and reel type mowers that average 26’ wide and can mow approximately 100 acres of grass per day. Clippings are returned to the turf at each mowing and are only removed if there is an excess after a long period of wet weather. 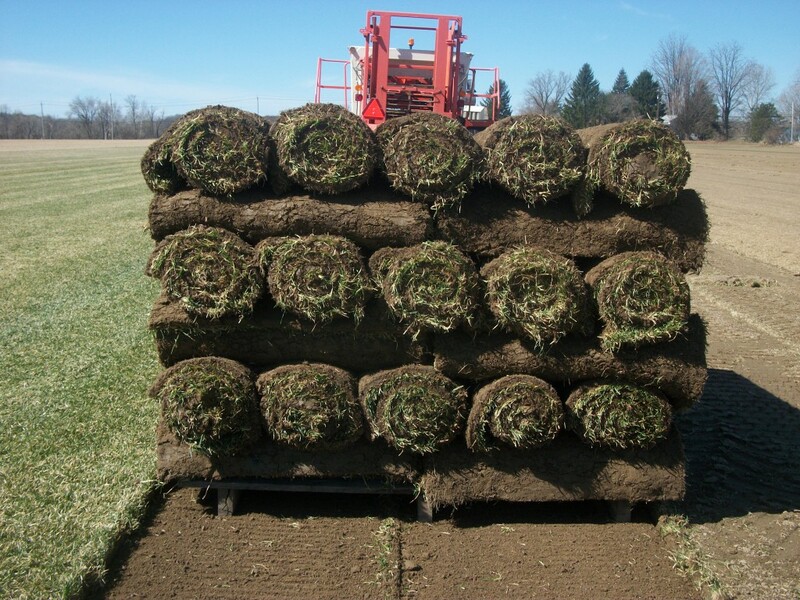 All of our sod is cut to order for immediate installation. Our production crew can harvest a pallet of Small Rolls (60 rolls of 2’x5’ strips= 600 sq. ft.) or one Big Roll of sod (4’x83.25’=333 sq. ft.) in a matter of minutes. One man and one machine can cut a tractor trailer load of sod (10,800 sq. ft.) in less than an hour. 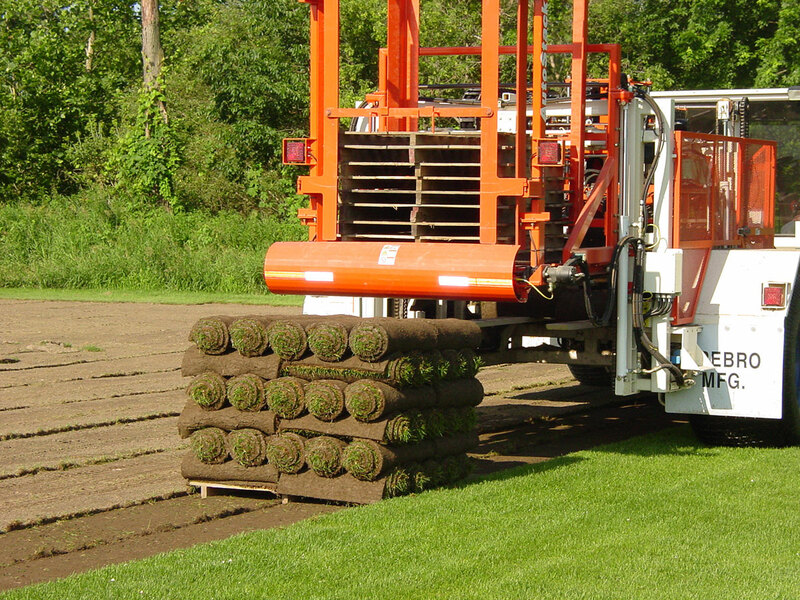 Each of our 5 tractor trailers can hold a maximum of 18 pallets of small roll sod (10,800 sq. ft.) or 30 big rolls (10,000 sq. ft.) for delivery, and our straight truck can hold up to 10 pallets of sod. Our Big Yellow Bags of garden soil or mulch are loaded onto the same trucks for delivery as well. All of our trucks carry portable forklifts for ease of loading and unloading at jobsites. 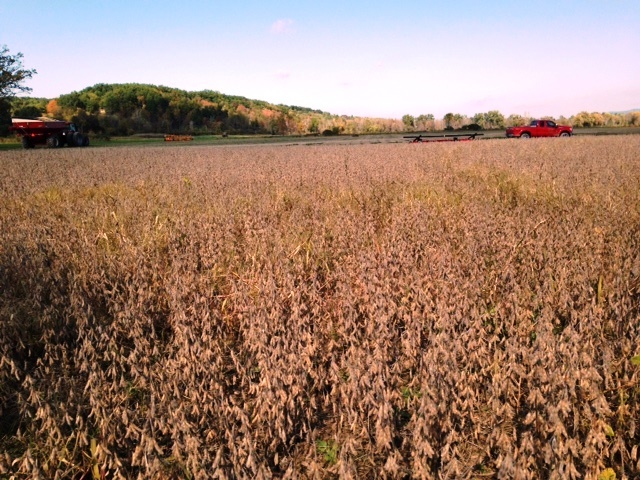 In addition to 600 acres of sod, we also grow approximately 500 acres of row crops- corn, soybeans and barley. Growing other crops adds diversity to farm operations. Most of these grains are for animal feed and are sold to companies for local distribution, or for export. We mix and screen black loam, peat loam, and decomposed manure to create our premium Black Garden Soil. We also carry Black Mulch for reducing weeds and retaining moisture around landscaping. Our Big Yellow Bags are filled with a heaping cubic yard of either garden soil or mulch—ready to be loaded on our trucks for delivery. With so much equipment on the farm and on the road, routine maintenance is essential. The shop crew is always busy overhauling machinery, changing out parts, sharpening mower blades, washing trucks and more.